When Simpson Saint Fort's mother-in-law entered serious stages of lung cancer, he and his family did what anyone else would do: they went to be with her. For the Saint Forts this meant moving from Haiti, Simpson's home country and the place where they had been living and doing humanitarian work, to Denver to care for his wife Christy's mother. They came to Colorado in September 2015 with just a three suitcases full of flip flops and t-shirts to stay with Christy's mother through her final days. When Christy's mother passed away in November, the Saint Forts suddenly were without housing amidst dealing with the loss of a loved one. They could no longer stay in the one bedroom apartment that was meant for Christy's 65-year-old mother, and getting approved for any apartment in Denver seemed impossible. Simpson's credit had been bad since his small business went under and on top of that the family still had financial obligations on property in Haiti. "When we were in Haiti and would see people walking down the street, we had shoes in our car and would be passing out shoes, helping people… it is weird being on this end. We never thought we would be in this situation," Christy Saint Fort said. The family was homeless and was on the brink of being on the streets. As a Veteran with a 20 year career in the Air Force, Simpson turned to the U.S. Department of Veterans Affairs. Quickly he was referred to Volunteers of America and everything started to turn around. "When you get to Volunteers of America, the doors you can open are unlimited." Working with Volunteers of America Veteran Specialist Mike DeSalvo, the Saint Forts were able to find a landlord that would lease to them and received assistance with their deposit and first few months' rent. When it was time to move in and the family still lacked many basic household necessities, DeSalvo help connect them with other organizations that provided mattresses, linens, kitchenware, and winter clothes, which they desperately needed. When Thanksgiving and Christmas came around, the Saint Forts did not think they would have the means to celebrate. 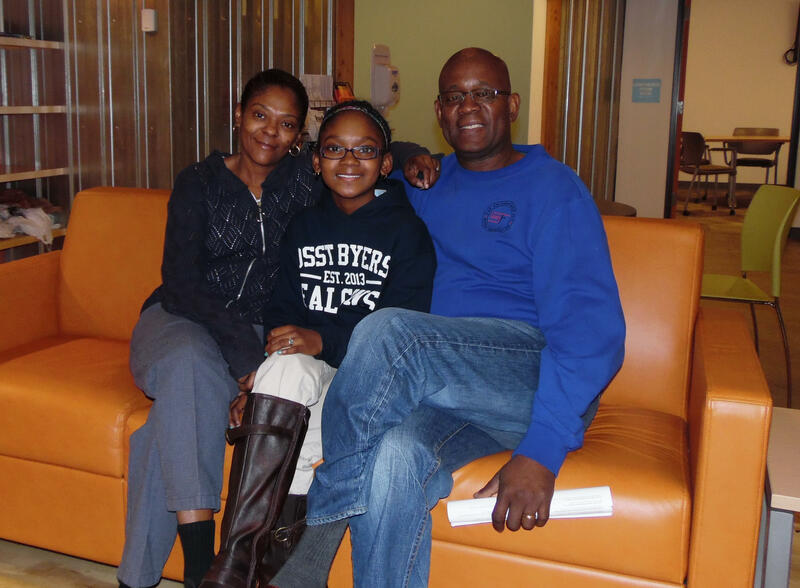 Thanks to Volunteers of America's holiday food basket programs, the family was able to prepare dinners for each holiday and even have presents for their 11-year-old daughter, Lashay. Since moving into their apartment, the couple has been working with Volunteers of America Veteran Specialist, Brad Allen, to secure employment. Simpson attended Volunteers of America's job fair and worked with Brad to get into a training program to become a truck driver. Christi, a certified dental assistant, is working with Brad to finalize her resume and find professional interview clothes. Simpson said he was blown away to find out that Volunteers of America could even connect them with an organization that would help Christy and Lashay get eye glasses. "Volunteers of America is like one stop shopping. Once you get there, they have connections to everybody. So once you get there, the possibilities of you getting help are unlimited." Today, the Saint Forts are passionate about spreading the word that help is out there if you are in need. "When I think about it, it is really overwhelming what they did for us. I am very passionate that people know that the help is here," Christy said.